As a resident of Arlington, I have a unique location to watch Capital Bikeshare “compete” with dockless bikeshare. I put “compete” in quotes because the mutual goal of Capital Bikeshare and the five dockless bikeshare companies is to get more people biking. However, some bike planners believe dockless bikeshare will pull enough people from Capital Bikeshare that it won’t be able to compete with dockless bikeshare. Since bikeshare is still new to most Americans, I want to make sure everyone knows the difference between dock-based and dockless bikeshare. As the below photo shows, dock-based bikeshare systems require the bike to be docked at a station. Capital Bikeshare is the main dock-based bikeshare system that operates in the DC region. As the below photo shows, dockless bikeshare systems have bikes that are self-locked. The five dockless bikeshare companies operating in the DC region are Jump, LimeBike, Mobike, ofo, and Spin. While Jump is the only company with e-bikes, LimeBike and Spin announced last week that they plan to start offering e-bikes soon. While all six bikeshare systems have apps, which are shown below, it’s possible to use Capital Bikeshare without the app by purchasing a pass at the kiosk. Since not everyone has a smartphone, this reduces the barrier to bikeshare. In addition, only Capital Bikeshare can be used by paying cash. Many low-income people don’t have a credit or debit card, so this gives them access to using bikeshare. I have a unique location to watch this bikeshare situation because of how the permitting process is unfolding across the DC region. While Capital Bikeshare is permitted to operate throughout the region, only DC has given permits to all five dockless bikeshare companies. As this Greater Greater Washington post explains, DC and Montgomery County, MD had an easier process than local jurisdictions in Virginia to create pilot dockless bikeshare programs because they are governed by Home Rule. Virginia is a Dillon Rule state, which means state law preempts local law. Local jurisdictions must receive permission from the General Assembly to act on local matters. Yes, Maryland is also a Dillon Rule state. However, Montgomery County became the first county in Maryland to adopt a home rule charter in 1948. Since DC is geographically small and dockless bikeshare companies have been struggling to inform their customers that they don’t have permits to operate outside of DC, I have been watching how human behavior and government processes react to this issue. Virginia is a Dillon Rule state, which is impacting the ability of local jurisdictions to create pilot dockless bikeshare programs and regulate the dockless bikeshare companies. This is why Virginia doesn’t officially have dockless bikeshare yet. Arlington wrote this blog post to educate people about the different types of bikeshare. I found the following statements interesting. “the six-month trial of dockless bikeshare is entirely a DC project at this time. The operators do not have an agreement with Arlington County so their operating location is within Washington, DC borders. If you see a bike in Arlington, you can contact the operator to collect their bike to take back into DC, or you can ride the bike back into the operating location (JUMP bike offers a $1 credit every when a bike is ridden back into the operating area). 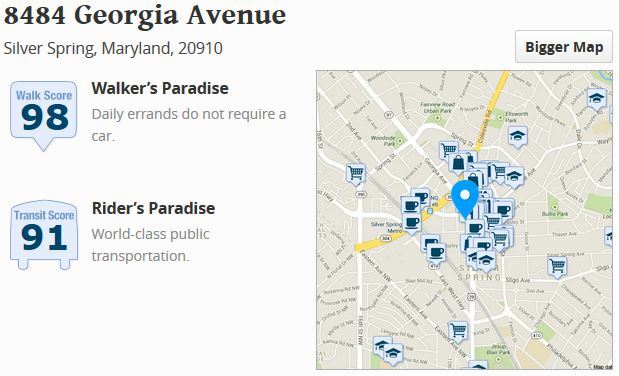 If this wasn’t confusing enough, only four of the five dockless bikeshare companies have permits from Montgomery County, MD to operate in Silver Spring and Takoma Park. I believe the fifth company, Jump, has decided not to expand to Montgomery County yet because it wants to focus on DC. None of the dockless bikeshare companies have permits to operate elsewhere in DC’s Maryland and Virginia suburbs. Plus, they can’t operate on National Park Service (NPS) property. This is important because the National Mall and regional trails like the Mount Vernon Trail are owned by the NPS. Even if the NPS gave permits to the dockless bikeshare companies to operate on its property, e-bikes are banned from NPS-owned trails. However, I haven’t seen this ban enforced and it doesn’t appear to be discouraging many people from riding e-bikes on trails. I am curious to see whether this controversial NPS ban becomes more heated as LimeBike and Spin join Jump in having e-bikes. Since many regions throughout the US are working on dockless bikeshare regulations and permit programs, I want to share the below regulation breakdown from Twelve Tone Consulting. The North American Bikeshare Association published the Dockless Bikeshare Regulation Preliminary Guidance in January 2018. Dockless bikeshare parking issues have been reported in many locations, so look at Dockless Bike Fail’s tweets for photo evidence. What do you think about the issues I have discussed in this post? Since my car-free travel behavior has changed dramatically between Portland and DC, I want to compare how my walking, biking, and transit riding habits have changed between living in Portland and now living in the DC region. Except for the few months in late 2015 and early 2016 where I fully depended on walking and riding transit in Portland because I felt too anxious biking, I mostly walked and biked for all my trips in Portland. I was planning to also mostly walk and bike throughout the DC region because transit is expensive (not as expensive as owning and maintaining a car). While I still walk and bike in the DC region, my boss provided me with a transit card for work trips so I have been riding transit much more than I planned to when I moved here. My boss also provided me with a Capital Bikeshare maintenance key (no time limits like normal keys) for work and personal trips so I haven’t been riding my private bike as often. Since I can’t carry my panniers on Capital Bikeshare, I have been mostly using my private bike for getting groceries and other shopping trips. I don’t live in DC so, while DC has bike racks almost everywhere and the bike racks are usually designed correctly, I have experienced no bike racks or poorly designed bike racks often in Arlington. The below photo shows a ladder or wheel bender rack at a grocery store near my home in Arlington. Thankfully, I don’t have to deal with bike parking issues when parking a Capital Bikeshare bike because I have always found an empty dock. Since I depended so much on the DC region’s great trail systems when I lived in the DC region during summer 2014, I was looking forward to depending on the DC region’s great trail systems again. Even though I rode a road bike last time I lived in the DC region, anxiety from my extreme fear of heights has gotten much worse so I have been struggling to ride on hilly trails like the Custis Trail and trails along steep cliffs like the Four Mile Run Trail. Since I doubt I will conquer my fear of heights soon, I’m planning to buy a $3-4,000 recumbent trike so I can reduce the anxiety I feel when biking on hilly trails and along steep cliffs. While the trails are great for long-distance trips, they don’t go everywhere so I still have to use on-street bike routes. I forgot how bad most of the on-street bike infrastructure is in the DC region. Yes, I know DC has protected bike lanes, which are actually better than any protected bike lanes in Portland. However, protected bike lanes in the DC region are on very few streets so I rarely ride on them. I’m missing Portland’s neighborhood greenways. I used to live at SE 27th and Salmon, which is on a neighborhood greenway, so I memorized the neighborhood greenways. I rarely had to ride on busy roads outside of downtown Portland because neighborhood greenways went almost everywhere. Thankfully, I have found one element of neighborhood greenways in the DC region. Sharrows are found throughout the DC region. Even though the DC region has installed sharrows, which is a critical and cheap element to Portland’s neighborhood greenways, the DC region has horrible wayfinding for cyclists so the sharrows aren’t part of a neighborhood greenway. Due to this, I feel sharrows are only used in the DC region to communicate to cyclists that the government believes that the street is safe enough for biking and to communicate to motorists that they should expect to see cyclists using the street. Sharrows do much more than this in Portland so I miss biking on Portland’s neighborhood streets. Before I totally dismiss the DC region’s on-street bike network, I’m excited to share that the DC region has several Level of Traffic Stress (LTS) maps. As all the below maps show, the DC region has plenty of work to do to make their on-street bike network feel more comfortable and less stressful. However, I find these maps much more useful than normal bike maps. This is mostly because a normal bike map shows all bike lanes the same while a LTS map shows bike lanes by how comfortable or stressful they are to ride on. According to a presentation by Stephanie Dock, who works for District DOT, at the Transportation Techies meetup in October 2016, District DOT will be publicly releasing their LTS map soon so I’ll add their map when it’s released. This blog post is getting long. I try to keep my blog posts under 1,000 words and will go over 1,000 words if I keep writing this blog post. While I still want to compare how my walking and transit riding habits have changed between Portland and DC, I may have to write about them in a new blog post. Readers, do you want me to write about my walking and transit riding habits in this blog post or start a new blog post? I’m excited to announce that I’m about to start my first full-time, permanent job in Washington, DC. I will be Bikeshare Planner at MetroBike, LLC. I copied the job description (removed compensation) below so you can get a sense of what I will be doing. The job mostly involves working with Capital Bikeshare on expansion plans in Arlington County, VA and Montgomery County, MD. Since MetroBike has a global client list, I likely will be traveling to other cities in the US and other countries. Maybe I will work in a city where you live! MetroBike, LLC is an internationally known bikeshare consultancy and the first of its kind in North America. Established in 2004, MetroBike has a client list which includes local and federal governments, non-profit and for-profit organizations, and universities. MetroBike is hiring a full-time Bikeshare Planner in the Washington, D.C. region to assist with planning for the Capital Bikeshare system. analyze data and write reports. passion for bikesharing and urban cycling. GIS skills are a plus. As I transition into my first full-time, permanent job, I would like to reflect on my initial reactions to the job, work environment, and living car-free again in the DC region. I plan to write a follow-up post after moving back to the DC region to reflect on how true my initial reactions were. I plan to also reflect on what surprised me about my new job, work environment, and living car-free again in the DC region. Since my blog is public and can be seen by my current and any future employers, I’m aware that I need to be careful about what I share so I don’t risk losing my job. While I am sure I will struggle with transitioning into my new job and may not enjoy every aspect of the job, the Bikeshare Planner position feels like a dream job so I’m thrilled to start working. I’m especially looking forward to using GIS and an equity lens to analyze potential bikeshare station sites. Since Capital Bikeshare has social and economic equity problems, I look forward to working with local government bureaus, federal agencies, private property owners, and civic associations to resolve the social and economic equity problems. I have so far only mentioned how my job involves neighborhood, citywide, and regional thinking. My job also involves site planning because I will be developing concept drawings for each bikeshare station site. Even though I just starting learning graphic design skills during graduate school, I hope my graphic design skills are good enough to create concept drawings for each bikeshare station site. Since I have seen many bike share stations installed in a manner that blocks pedestrian and wheelchair movement and limits how much space is available for sidewalk cafes, I look forward to coordinating construction of pads and bulb-outs for the stations. I also have seen bike share wayfinding, markings, and delineators installed poorly so I look forward to helping to coordinate this process as well. Since I’m a data nerd and enjoy writing, I look forward to analyzing bike share data and writing reports. Hopefully, some of the data will show the economic impact and traffic congestion relief of bike share. MetroBike doesn’t have office space so my boss and I will be working from our own homes and meeting probably at least weekly to check in on work projects. Yes, my boss only has one employee. I have never worked a home-based job before so I’m definitely nervous about how it will feel. Since I have always had a roommate, I’m debating whether to try and find a new roommate in DC or live alone. I get depressed when I’m alone for too long so I enjoy talking with a roommate. However, I’m not sure how easy and comfortable it will be to do a home-based job with a roommate that I just met. In case you’re wondering, my job isn’t 100% home-based. I will have to travel to meetings and check on bike share station installations. As my previous Washington, DC blog posts show, I enjoyed living car-free in the Washington, DC region during summer 2014. I home was located in Silver Spring, MD and Tacoma Park, MD so most of my car-free experiences were based in the Maryland side of DC. I haven’t decided where I plan to live in the DC region yet. My boss said he is open to me living anywhere within close proximity of Capital Bikeshare so I basically have freedom to live almost anywhere in the DC region. My biggest transportation concern about moving from Portland, OR to Washington, DC is how quickly I can ship my hybrid and road bikes using Amtrak Express Shipping. I was considering whether to sell my bikes and buy new bikes in DC. Since I’m a bike snob and haven’t been able to so far find the specific types of hybrid and road bikes I wanted at affordable prices, I have decided to ship my hybrid and road bikes to DC. My flight from Portland, OR arrives in Washington, DC on Friday, October 7. I have arranged short-term housing with Michael Schade, who I met in 2014 and is also a transportation nerd, until I can find long-term housing and possibly a new roommate. As some of you know, I was a transportation planning intern at Toole Design Group in the DC region during summer 2014 so I am already familiar with the region. I know the DC region has changed in the past two years so I look forward to seeing how it has changed. I also look forward to writing blog posts about my reactions to living and working in the DC region again. Since my job search process was frustrating, I want to reflect on what lessons I learned during the process. From January 31 to September 27, 2016 (I graduated in June so I applied for most of the jobs after graduation), I applied for over 100 jobs, was invited to interview for over 25 jobs so far (I’m still receiving more interviews), and received two job offers. My other job offer was for part-time, temporary GIS Technician at Tigard, OR. Even though I definitely feel prepared to start working as the Bikeshare Planner at MetroBike, I almost didn’t apply for the job because I wasn’t sure if I met the required qualifications for the job. MetroBike’s Bikeshare Planner qualifications require 3–5 years of related experience. While I have worked multiple internships that involve working on bike sharing, including for Charlotte B-cycle (Charlotte’s bike share) and consulting on Indego (Philadelphia bike share), both of these internships were only a few months so they didn’t add up to 3-5 years of related experience. I don’t think the sum of all my work experience, which includes mostly part-time internships, is at least three years of experience. The lesson I learned is don’t be afraid to apply for a job because you don’t think you meet the required years of work experience. As my previous blog post discussed, I kept being asked during many interviews about whether I have more than just bike planning experience. I tried to convince interviewers that I have multimodal planning experience, but my resume is full of bike planning experience so this proved challenging to accomplish. 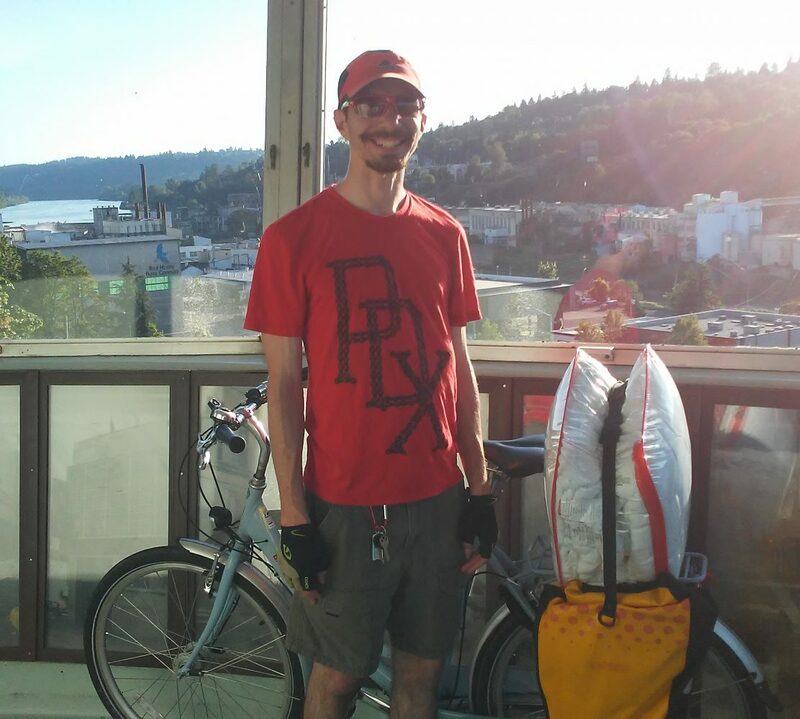 Since most interviewers assumed I was living car-free because I lived in Portland, OR and my resume is full of bike experience, I was also asked during many interviews whether I am comfortable driving an automobile. I believe MetroBike was the only employer who asked me whether I am comfortable with city biking. The interviewer from MetroBike actually saw my bike during our Skype interview so he knew the answer to his question before having me answer it. The lesson I learned is even bicycle and pedestrian planning jobs that don’t directly involve automobile planning still often require driving an automobile. The Bikeshare Planner position at MetroBike may be the only job I was interviewed for that doesn’t require driving an automobile so I am feeling lucky. What does 0 to 100 mean? My home in Kannapolis, NC has a walk score of 0! Even though I bike from here, which feels dangerous, it doesn’t even have bike or transit scores. Due to this, I am forced to use the private automobile for most of my trips. Even though this may appear like I am against the use of the private automobile, I see value in using the private automobile for long trips to remote locations where other modes of transportation may never reach. When modes other than the private automobile can reach my destination, I desire to walk, bicycle, use transit and the train, and any other sustainable mode of transportation. For me, it all comes down to the freedom to choose which mode of transportation I want to use. Toole Design Group’s Washington, DC office, which is where I will be a transportation planning intern starting in July, has a walk score of 98 and transit score of 91! Staring in September, I will be a Master of Urban and Regional Planning student with a transportation specialization at Portland State University, which is located in downtown Portland, Oregon. 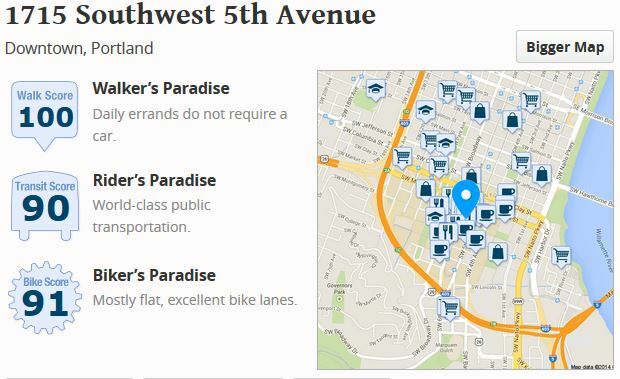 Portland State University’s Urban Center, which is where most of my classes will be located, has a walk score of 100, transit score of 90 and bike score of 91! What is your walk score? Find out here!